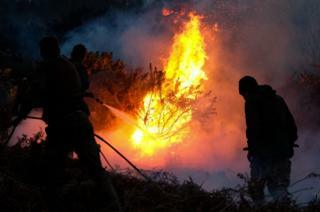 More than 30 firefighters spent five hours battling a huge gorse blaze in the Cleveland hills. The fire consumed almost 1 sq mile (2 sq km) of bushes near Guisborough Woods on Saturday. Alan Brown, group manager of Cleveland Fire Brigade, said the biggest challenge was getting water to the remote spot, with which they were assisted by local gamekeepers. Mr Brown said it was too soon to speculate but asked members of the public to be mindful of discarded fires, cigarettes or glass bottles which could start a blaze when the sun strikes them.